Being able to to become stronger isn’t just throwing weight on a bar and lifting it. It requires some degree of skill. Some exercises require more skill than others. For example, the ability to perform a power clean can take years to learn proper form as the whole body is involved. The bicep curl however, you can learn to do that in a matter of minutes. 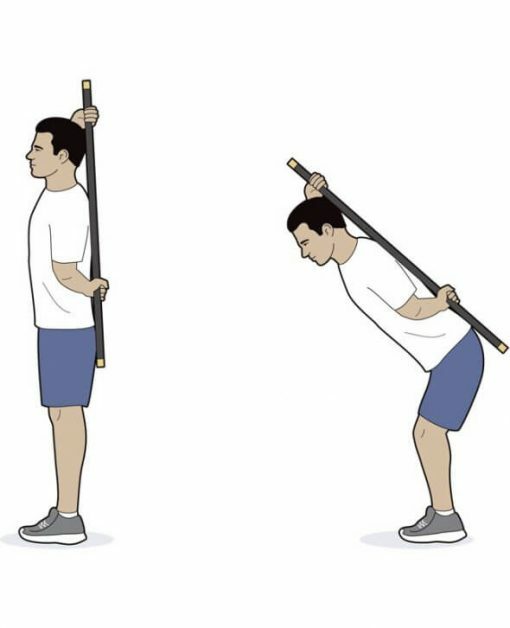 We find that one of the most important movements that need to be learned once a sufficient degree of core strength and stability is achieved is the hip hinge. The hip hinge is a fundamental movement pattern that has to be learned. Most people cannot do a hinge properly without some degree of coaching in the early stages of training. The hip hinge teaches us to “unlock” our hips and move in a way that also ensures spinal stability. You probably know of something who injured their back just by bending over and picking up an object off the floor. The proverbial “straw that broke the camel’s back.” It wasn’t the object that most likely injured the back. It was years and years of incorrect technique compounded over time that caused the issue, not the “straw.” You can’t just bend over from the waist and expect your back to function properly, especially with a weighted object. It is a potential recipe for disaster. Grasp a wooden dowel and place it against your back. The dowel should be hitting three points of contact: tailbone area, between the shoulders blades, and the back of the head. You may have a slight curve in your lower back, but keep your abs braced during the movement. Brace the abs and push the hips back, causing you to lean forward while keeping the three points of contact listed above. You should feel some tension in your hamstrings and hips. Drive your heels into the floor and squeeze your glutes while returning to the standing position. Once a proper hip hinge is performed, then we can start working on adding weight to your basic exercises such as bridges, squats, deadlifts, lunges, step-ups, etc.